The apricot tree is a hardy, though finicky, fruit. 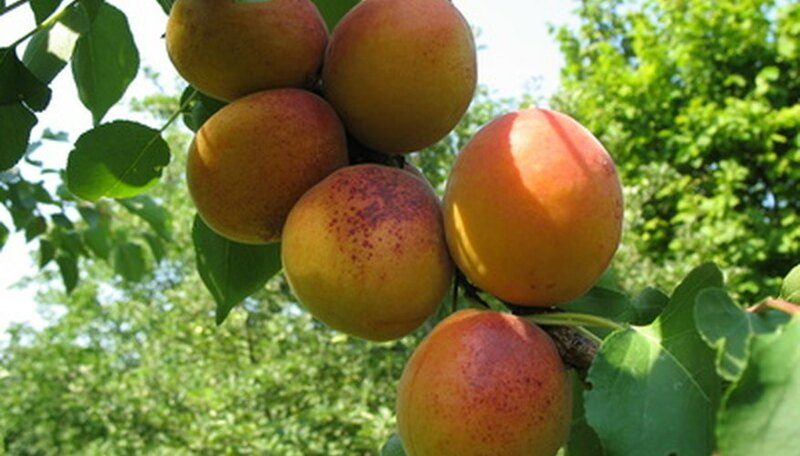 Although there are mainly three different types of native apricot—the Chinese apricot, Japanese apricot and desert apricot—the tree has been cultivated successfully in the United States, and several varieties of the apricot tree are available for planting. The trees do well in areas with cold winters, warm springs and dry summers. The Chinese apricot is native to northern China and throughout central Asia. The tree reaches a height of around 33 feet, with dark brown bark and oval leaves. Its genus, Prunus armeniaca, has been cultivated widely over the centuries and there are varieties available for planting in several growing regions. In the United States, these types include Deatrich, Gldcot, Hargrand, Jerseycot, Puget gold and Vivagold. The Japanese apricot, also called the winter plum, is not native to the United States but can be grown in southern climates in hardiness zones 6 through 8, according to The United States Department of Agriculture. The tree grows to a height of 20 feet and its bark is thin and prone to injury. The leaves are oval shaped and the tree flowers in late winter and early spring. The fruit is edible, although sour, and is routinely pickled and eaten in Japan. The desert apricot, classified as a tree-shrub, is native to the southwestern United States. The tree grows to a height of 12 feet and its bark is reddish-brown. The leaves are rounded ovals and the flowers bloom in the early spring. The fruit, which is edible and eaten by wildlife, ripens in the summer. The tree usually grows in canyons in sandy soil.